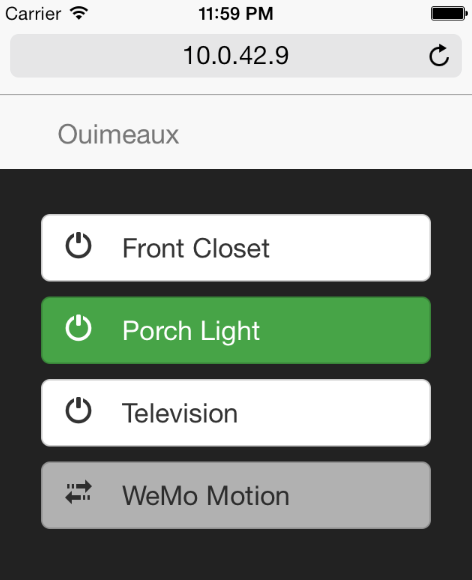 wemo server starts a process serving up both a Web app providing basic device control and a REST API allowing integration with any number of services. The IP and port to which the server will bind are specified by the listen parameter in the configuration file. Default: 0.0.0.0:5000. Optionally, basic authentication can be enabled for the web server by setting the auth parameter in the configuration file. The Web app very simply presents buttons allowing control of devices and indicating current state. Motions appear as disabled buttons but will turn green when activated. POST /api/environment Initiates a discovery of the environment. Optional seconds argument (default: 5) determines length of discovery. GET /api/device/NAME Returns a JSON description of the device named NAME. NAME will be fuzzy-matched against device names, as on the command line (e.g., “closet” will match “Hall Closet”). POST /api/device/NAME Toggle switch state, specified by optional state argument (default: “toggle”). Valid values are “on”, “off” or “toggle”.